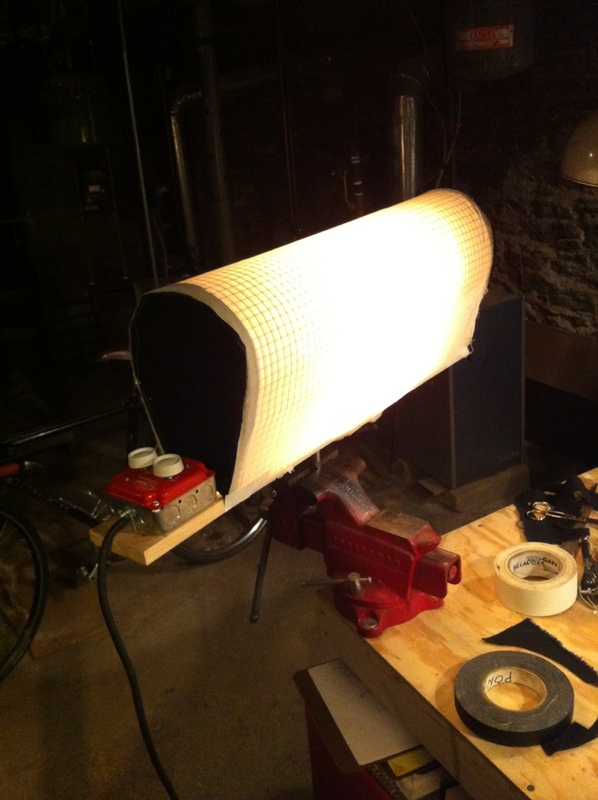 Last week, I finally made a covered wagon light. If you’re not familiar, a covered wagon is a diffused light for filmmaking made mostly with supplies available at a typical hardware store. They use porcelain sockets to hold household bulbs in the middle of a tube of diffusion. The diffusion material is held in place with chicken wire! There are two dimmers that each control two sockets each. I first used one when Ashton brought his pair up last June for “Backgammon.” If I remember correctly, he had his skinned with unbleached muslin and quarter grid. They worked well and often during the month long shoot. I made mine almost exactly the way Ashton made his, only with one difference. His first and third sockets were wired to one dimmer and second and fourth sockets were wired to the other dimmer. In my wagon, I wired the first and fourth socket to one dimmer and second and third sockets to the other dimmer. Very subtle difference, but I figured I’d try it out. Finishing it up on the workbench. On the bottom of the 1″x4″ board is a baby plate, which makes it easy to mount in a stand. The plate can be quickly removed so the wagon sits flat on the ground. 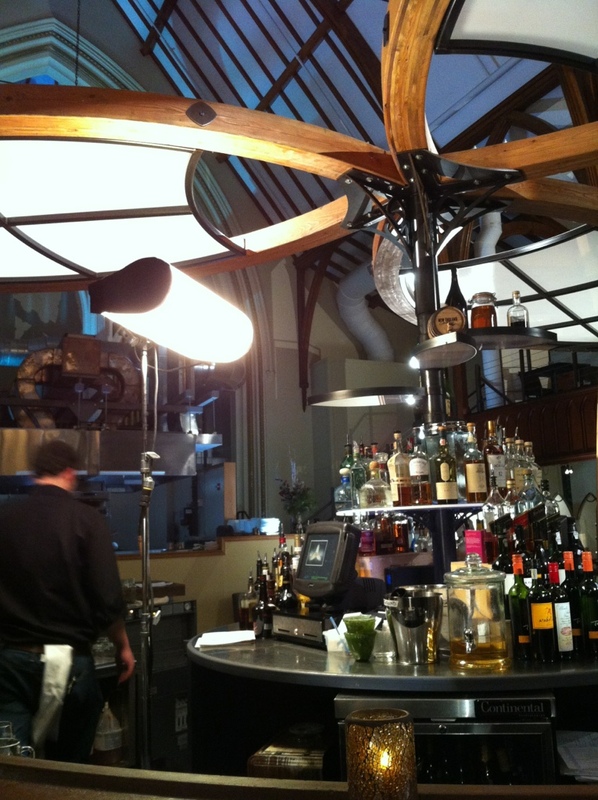 Lighting up a bar scene a few nights ago with Dean Merrill. This is one of the many shots we lit with the covered wagon. Total cost of the wagon was definitely less than $50, but I sourced some of the parts for free. The sockets I used were the Leviton 9880. There are cheaper options for sockets, but I liked these because the contacts are covered up and maybe a little bit safer. Since the wattage is fairly low, you can get away with wiring the bulk of this with 16/2 wire from a simple extension cords. You’ll need two dimmers, which should be able to handle 600 watts each, a double gang box to house them and a double cover plate. I used a few feet of 16/3 wire and a grounded plug to finish off the electrical work. The chicken wire doesn’t have to be anything to special. I used a tougher kind than I really needed because my landlord gave it to me. Freebie. I used scrap duvetyne to cover the ends, but scrap black wrap will work just as well. As for diffusion, you can chose whatever kind works best for your situation. I used unbleached muslin because I love the color and texture it creates. I think it matches the type of lighting that we would use the covered wagon for. Bleached muslin, grid cloth, and diffusion gel are all good options too.